You Are Here: Home » Our Farm Animals » I broke my “Golden Rule”! I broke my “Golden Rule”! Yep, really didn’t think I’d ever do this but I suspect a couple of my neighbors knew it was just a question of time. I got a horse. I full size horse. Actually I’d call it a horse & a half! Let me tell you how I came to have “Tank”! 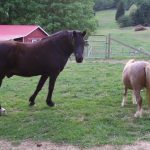 Of course with me it’s never simple so here’s what happened… Last week I answered an ad on Craigslist – a lady had 2 trained miniature gelded horses (I didn’t feel either one to confirm their sexual status), for sale along with a couple of saddles. One was from a petting farm and was very much accustomed to having children all around him and the other was just a beautiful little childrens horse that was the pet of a 2 year old boy. I even saw a picture of this little child riding this little horse with a saddle & all! She claimed to have to sell all of her horses because of a sudden re-location. She also had 2 full size horses. Scott & I got there & a young girl was riding “Buddy” while another was walking “Brownie”. Brownie was quite the looker whereas Buddy looked like a beat up old horse (although they’re both only 4 years old). I bought them both and we loaded them up. I hate to admit to this but it was an emotional purchase – not a conscious one. The lady sort of pleaded with me to take the full size horses also -she wanted good homes for them. She originally wanted $400 for Tank but gave finally gave in to $100 including 2 saddles. Trust me, I didn’t give in right away. I know how much work full size horses are. She claimed Tank was a very gentle old horse (around 10 – & that’s been confirmed), but only had one speed, slow. Scott thought it was a good idea and we loaded up tank also. She really wanted me to take the other but one was enough. When we all got home and put the boys in a separate enclosure from my girls it was obvious that Brownie wanted to be with Ol Blue & we let them romp together. He immediately mounted & bred her and she was ready. Wow.. this guy was supposed to be gelded. My neighbor Earl showed up and checked out the boys. Surprise! Both were intact but Brownie only had one testicle. This condition is called Cryptorchidism & as you’ll read from this link is a very undesirable condition. The next day my neighbor Val who’s a licensed farrier and horse expert came to tend to their feet and assess my purchase. Tank received a high note & so did Buddy although he’s a little thin and has a dry cough. She strongly recommend that I find Brownie a new home as soon as possible. 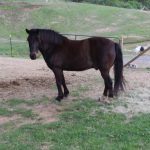 Surgery for this condition can easily run past the $500 mark & I didn’t intend to spend that for a little horse that I had no idea if he could drive (the purpose of me purchasing him). Tuesday evening Earl picked him up and brought him to a horse auction in Cleveland (TN), and I sold him to a nice lady that fell in love with him. I told her he was a stallion but she didn’t have any mares so that didn’t bother her. I’m confident that he found a good home. He was a very good looking little horse and was certainly high spirited. As for Buddy, he still looks like a beat up old horse but he’s very small and very gentle with children. The vet will be here Tuesday to geld him and see if we need to g ive him anything for his cough. As soon as I get the “ok” from the vet, he’ll share the same field as the donkeys, Ol Blue, Toffee and big old Tank! I purchased a saddle and a bridle for Tank and I look forward to my first ride on him. I hope he’s as gentle as the seller claimed he was! I’ll keep you posted!